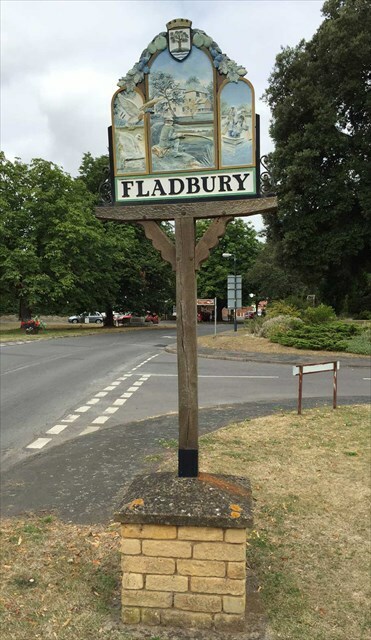 A simple multi-cache with the co-ordinates for the final stage determined by a search northward from the pictorial village sign in the centre of Fladbury. The sign depicts a number of local activities and pursuits - leisure on the River Avon including fishing and canoeing and the fact that it was one of the first villages in England with electric light courtesy of a Victorian hydro-electric plant at Fladbury Mill. Agriculture also features with fruit growing, particularly plums but also apples and hops. Parking is available around the village green – busy when the pub is open – and by the roadside. Fladbury doesn't have a general store so chocolate purchases are off the menu. However it does have an excellent butcher, two pubs and a hairdresser. So it’s a large pork pie, a pint and a quick trim, please.